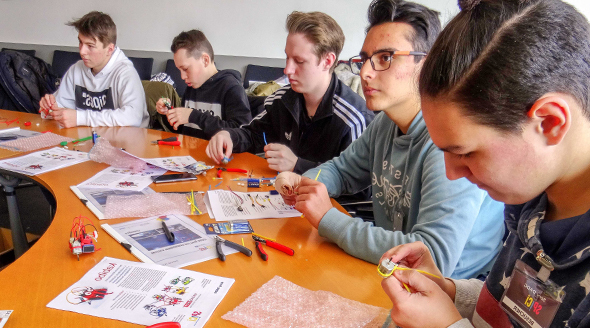 SP!CI – short for Success Stories about Professions in Cool Industries – is an innovative project, which targets at attracting pupils from New Middle Schools (NMS) and secondary schools to technology. Initiated by the Federation of Salzburg Industries (IV Salzburg) already 10 years ago, this exceptional project gained large acceptance and support by the local industry. 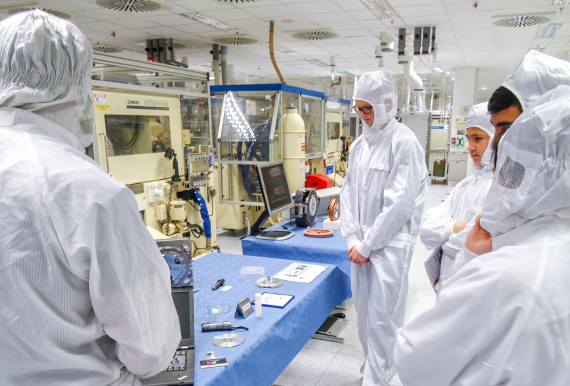 On 28th February 2018, 26 pupils from the NMS Grödig were granted an exclusive insight behind the cleanroom doors at Sony DADC in Thalgau. At different booths, they had the opportunity to put their theoretical knowledge from school into practice and finally deepen it with a questionnaire. The exciting agenda included a tour through our cleanroom, measuring the thickness of CDs, creating a spectroscope and experiencing the journey from the raw material to the finished disc as well as the presentation of job profiles and available apprenticeships. The importance of robotics and automated processes for the production got demonstrated with a robotic bug, which finally started into the race to win the Grand Prix of Sony DADC. The varied programme got rewarded with a high level of interest and interaction. We were thrilled to again be part of SP!CI and to awaken the pupils’ interest for technology. The event also got covered on the website of the Federation of Salzburg Industries.